Volkswagen hit the spot last year with its rendition of Gene Kelly performing ‘Singing In The Rain’, 21st Century-style. The ‘Singing In The Rain’ spot features the famous scene from the 1952 musical movie, “Singing In The Rain“, in which Gene Kelly’s character. Don Lockwood ecstatically celebrates his love for Debbie Reynold’s character, Kathy Seldon, dancing through the street, playing with the rain. As the ad progresses we realise that this is somehow upbeat. Kelly’s voice is provided by Mint Royale. Instead of tap dancing Kelly break dances through the saturated set. 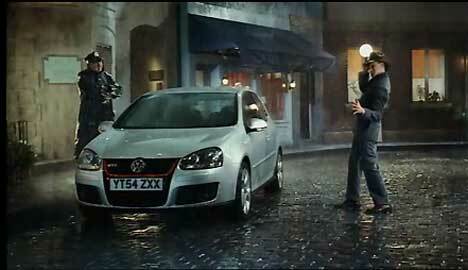 The spot finishes with Don Lockwood dancing up to a Volkswagen Golf GTi. The voiceover: “The new Golf GTi, the original, updated”. The Singing in the Rain approach was developed at advertising agency DDB London by creative director Jeremy Craigen, Steve and Martin (art director Steve Jones and copywriter Martin Loraine), agency producer Richard Chambers and account manager Matt Ross. The VW ‘Singing In The Rain’ spot was directed by NE-O at Stink, with director of photography Patrick Duroux and producer Blake Powell. Filming was shot at Shepperton Studios, with care taken to ensure that the new dancer’s body and head connected with the body and head of Gene Kelly’s original footage. Editor was Tim Thornton-Allan at Marshall Street. Special effects were developed at Moving Picture Company by lead inferno artists Alex Lovejoy and Christophe Damiano, inferno artists Nico Cotta, Ziggy Zigouras, Dan Sanders, Darren Christie, Eileen Chang, combustion artists Giuliano Cavalli and Daniel Adams, with telecine artist Jean-Clement Soret and post producer Graham Bird. 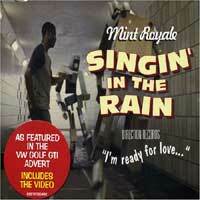 See more links for the Mint Royale renditions of ‘Singing In The Rain’ at No Fat Clips, including the Sam Brady directed music video.